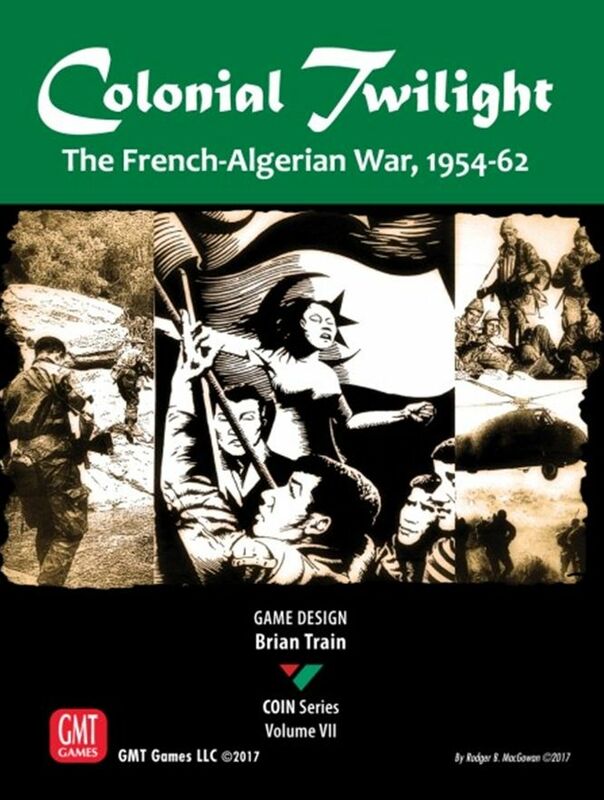 November 1st, 1954: On the eve of All Saint?s Day, armed members of the Front de Liberation Nationale arose in revolt across Algeria against the French colonial government. The authorities suppressed these first incidents quickly, but this date marked the beginning of an eight-year war that saw hundreds of thousands of casualties, widespread atrocities and reprisals, political and social turmoil, and the effective end of the French Empire. Colonial Twilight takes players into the tangled web of military and political actions comprising this anti-colonialist struggle. The Insurgent, starting from modest beginnings, must build massive and enduring popular support for his cause, and organize to assume power when Algeria finally gains its independence. The Government, representing both the colonial authorities and France's military leadership, must engage the nationalist insurgency decisively while striving to preserve the support and commitment of the civilian government and society. Players will enter the ?heart of darkness? as they use military, political, and economic actions and exploit events to build and maneuver forces to influence or control the population or otherwise achieve their aims along the twisting route to independence. Subversion, torture, factionalism, coups d?etat, forced resettlement, foreign sanctuaries, ambushes, ?neutralization?? the whole grim catalog of a pitiless war is there, with a political and moral legacy that French society is only now beginning to confront. This latest installment in GMT?s popular COIN Series system is the first to be designed for two players. You must consider carefully just what you want to do, and how much of it, before the initiative will slip from your fingers. Also, a full solitaire system enables solo players to test their skill against a devious game-run enemy.